Introduction: This region is the Terrestrial Paradise, an especially lovely place. Paradise is completely surrounded by fire whose flames reach the sky. … In Paradise lies a source divided in four rivers: One is Euphrates, the second Tigris, the third Gyon, the fourth Phison.… Isidore speaks about this place saying that Paradise is situated in the middle of the Equator. This is an abbreviated caption from the Catalan Estense World Map (c. 1450/1460) describing a circular garden surrounded by flames and placed in eastern Africa, from which the mentioned source springs and in which two red figures pray under a tree. Placing Paradise in eastern Africa on medieval maps is very unusual – as will be seen in this article – and is at the same time typical for late medieval mappae mundi that were both bound by tradition and innovation, determined by contemplations of salvation history as well as practical spatial considerations. The Modena Map and its situation of Paradise will be, in this essay, the main example for some considerations of the realism of mappae mundi – which are very often taken as the clear opposite of modern maps based on the measurable “reality” of geography. 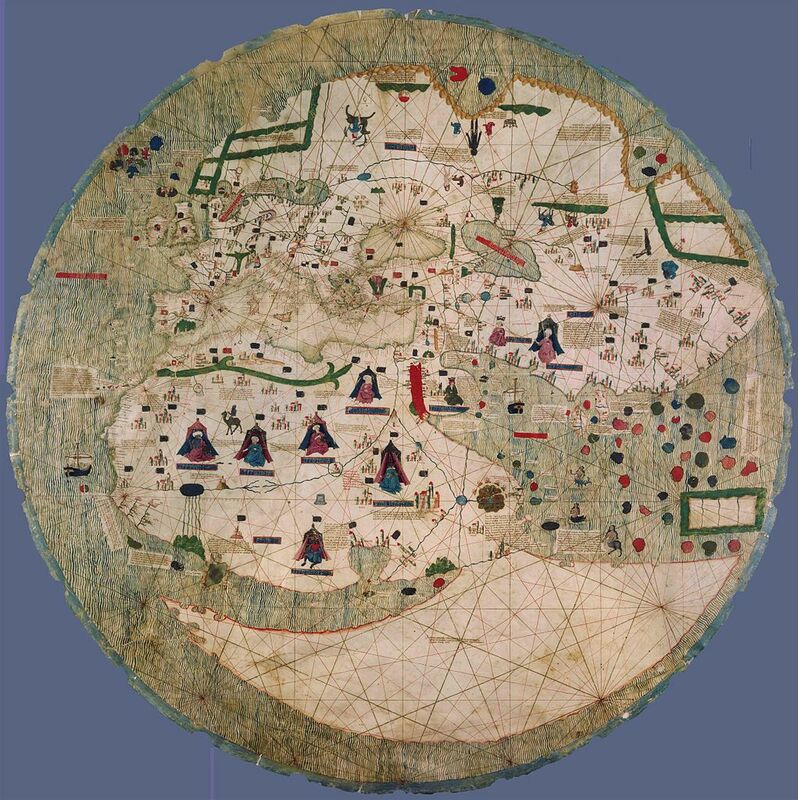 Medieval mappae mundi do not represent geographical space in a way we are used to. From a modern point of view, they show earth in an incorrect way, with distorted dimensions: they are, allegedly, not yet able to represent space in a rational and useful way. Looking at them from a medieval point of view they may not at all have been intended to fulfil expectations like these modern ones. Scholars who judge mappae mundi by medieval standards usually emphasize the salvific over the practical aspect. But were mappae mundi truly not “realistic”?